The Constitutional Council of Senegal will publish on Sunday the final list of candidates for the presidential election of 24 February. With the final publication of the list of candidates for the presidential election, the tension is rising between the government and the opposition. 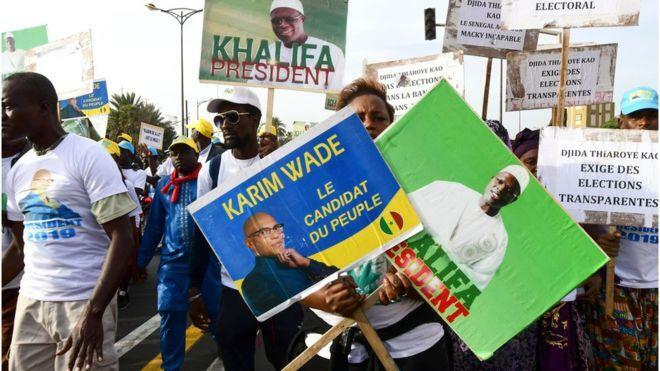 After the submission of applications and a first screening, five files were selected and some excluded from the electoral process as the former mayor of Dakar, Khalifa Sall, and Karim Wade had filed appeals. The two opposition leaders will be seated on Sunday. But by then, the tone rises between the power and the opposition by means of press organ interposed. If we stick to the review of the Senegalese press, the presidential election on 24 February will be particularly tense because of the climate of “settlement of political account” that has blown over the country for almost two years. In a video posted on his official page, Bartelemy Dias, the mayor of Sacre-Coeur Dakar, warns the Constitutional Council of its responsibility in case of chaos in the country. “We are not cowards, and we will not back down because Senegal belongs to us. We will do everything to show Senegalese the true face of the President of the Constitutional Council, Pope Omar Sakho, so that if tomorrow Senegal falls into chaos people will know who is the only one in charge,” says Barthelemy Dias. In a widely circulated text on social networks and online news sites, the lawyer Seybani Sougou believes that the exclusion of the candidate Taxawu Senegal coalition, Khalifa Ababacar Sall devotes “judicial anarchy” in Senegal because of the misreading of the law by the Constitutional Council. The National Resistance Front (FNR), a movement linked to the PDS (Senegalese Democratic Party), denounces for its part a witch hunt orchestrated throughout the country by the government and which is manifested by targeted arrests. The FNR believes that such practices can only be the work of “apprentice dictators”. For President Macky Sall, the opposition’s remarks and manoeuvres were inevitable because he said “we cannot beat someone and forbid him to cry”. Faced with this climate of tension, the Senegalese civil society calls for calm and consultation between the government and the opposition. In an electoral and political context tense for almost two years, verbal escalation can lead to violence. “Only dialogue can lead to solutions that can preserve peace,” said Babacar Gueye, one of the leaders of the Senegalese civil society collective for elections.